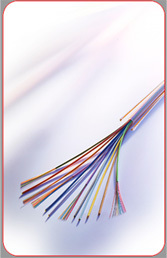 Welcome to Caledonian dedicated web site for Fireproof cables. Fireproof cables are designed to function properly also during the fire. The emission of smoke in this situation is free from corrosive gas and to help those working towards fire safety in the built environment. In all fire disasters, fire smoke, heat and toxic fumes are the main obstacles to safe evacuation of a building or area. A major contribution towards overcoming these hazards is the use of fireproof cables having fire resistance, fire retardance, low smoke and non-halogenated properties. To describe a cable as ‘LSHF’, it must pass two tests: (a) a smoke cube test, which sets a maximum accumulated smoke density produced when burning the cable with a standard fire, and (b) a corrosive and acid gas test where the cable materials are roasted and must give off a maximum of 0.5% acid gas. These tests are both specified in cable standards which include the description ‘having low emission of smoke and corrosive gases when affected by fire’. Cables made from PVC or similar halogenated materials are unlikely to pass these tests. A common misunderstanding is that a ‘LSF’ cable means it has only passed the smoke test and not the acid gas test. We prefer to use the ‘LSHF’ designation as it reinforces both requirements. -These are used in the design and installation of fire alarm systems.